A Shiny, Happy Return For R.E.M. In the 1980s, R.E.M. was a college band on the cutting edge of the alternative rock scene, and it didn't take long for them to become a "super-group." But as Anthony Mason reports, the band has had its ups and downs since. The group is hoping a new album will be the beginning of its resurgence. The success of the band R.E.M. has been a "man on the moon" kinda thing - stratospherically surreal. After all, this was the college band that spearheaded the indie rock movement of the '80s. Then lead singer Michael Stipe and company evolved into the supergroup that's sold more than 50 million records. R.E.M. will release its 14th studio album this week, their music showing a renewed urgency and velocity. An answer, perhaps, to critics who suggested the band was showing signs of old age. CBS News correspondent Anthony Mason told Stipe about a British magazine article that recently described him as the grand old man of college rock and asked him if he felt like a "grand old man." "No," he said laughing. "I like the idea that as a 48-year-old, I think part of my job as a public figure is to be 48 years old, and kind of unashamedly embrace everything that that entails ... most of it!" To record the new album, Stipe and guitarists Mike Mills and Peter Buck returned to Athens, Georgia, the college town where it all started for R.E.M. "On April 5th it will be our 28th year since our first performance," said Peter Buck. "Well, it's for some reason, everyone just remembers it. I don't know why. And we always call each other on the 5th. We go, 'Oh, Happy Anniversary!'" Though Buck, Stipe and Mills all have houses in other cities, Athens is their spiritual home and where R.E.M. has had its headquarters for 15 years. In the band's second floor office overlooking the heart of Athens, Stipe - himself a photographer and film producer - has been reviewing publicity photos. Always the band's unabashed frontman, more than anyone Stipe has defined the image of R.E.M. He even helped design the cover for the new album, "Accelerate." "The idea was to take this kind of punk rock aesthetic," Stipe said, "which is pre-computer." The result is like a school crafts project from Stipe's own photographs that were photocopied, cut and pasted. "It's a collage, in effect," observed Mason. "It's a collage. And it's a city of the future," Stipe said, describing the imagery. "We often have a lot of fun doing what we do." Stipe likes to show off his mischievous streak. During a break in the interview, he spontaneously challenged Mason to a staring contest. "We'll have a stare countdown. One, two, go..."
Mason asked Stipe about the influence of punk rock on his music. "Well, I was reacting to a lot of things that felt not very genuine in music and in pop culture at the time," he answered. An Air Force brat, Stipe moved to Athens when his father retired here. By the time he enrolled at the University of Georgia, he knew he wanted to be a singer. "I felt like I had a place," Stipe told Mason. "You know in 1980, there just weren't a lot of people like us in this town," Peter Buck said, explaining how the band members hooked up. "That's the site of the record store where Peter and I first met," Stipe said. Buck worked at Wuxtry Records, a secondhand vinyl store. Stipe was a regular customer. "Michael said that he was a singer. And I had been in bands," Buck recalled. "And my problem was, I thought, to have a band you have to have a great singer. And in Georgia at that time it was mostly guys who wanted to play 'Hootchy Cootchy Man' for 20 minutes and then would sing every verse out of key. And the first time I played with Michael and he sang, I thought, 'Well, this guy's a singer, alright.'" R.E.M. would emerge as the most popular college rock band of the '80s. They cracked the pop charts in 1987, when "The One I Love" made the top 10. Four years later, "Out of Time" took them to the top of the album chart, behind the mega-hit "Losing My Religion." By the mid-nineties, the college band had become the supergroup, signing a record-breaking $80 million recording contract. But then, at the peak of their popularity, R.E.M. almost unraveled. "Have you ever wanted to quit the band?" Mason asked. "I think all three of us have at one point or another," Buck answered, "and Bill did." In 1995, during a concert in Switzerland, drummer Bill Berry suffered a double brain aneurysm on stage. He recovered, but two years later Berry decided to quit the group. The photograph from their last day as a four-man band hangs on the R.E.M. office wall. Stipe still doesn't like to look at it. "That was kind of a rough day," he said, looking at the picture. "Well, you can see it on my face, huh? That wasn't the best day of my life." In Stipe's words, R.E.M. had become "a three-legged dog." Mason asked him how they dealt with the situation. "We didn't deal with it well," Stipe told him, "I'll say that." Stipe, Buck and Mills struggled to figure out who they were going to be without Berry. "When Bill was there, there was a natural balance," Mills explained. "Without Bill, everything started tilting different ways." "You lost your equilibrium?" Mason asked. They fought. At times, they barely spoke. "It's kind of always been us against the world for, like, 28 years," said Stipe. "And more recently it was like us against ourselves. And I think we had to really fight to maintain the level of potential greatness that I think we all know that we're capable of." And with "Accelerate," the band understood it might be their last chance to reclaim it. They set up shop in a restored chapel at the University of Georgia, and spend three weeks recording parts of the new album. "This particular record was kind of a time of refocusing for us," said Mills. Mason asked the band members about their recording process and whether they began with an idea of how they wanted the album to turn out in the end. "With this one we definitely did. We wanted to make it short, aggressive," Mills explained, "because the last few weren't." Fans had been deserting them. Sales were sliding. One critic called their last album "resolutely bland and unmemorable." All three now agree it was their low point. Mason asked the band if there was a feeling that they needed to prove something to themselves. "Yes," Stipe answered, "but there's another aspect to that, which is that we've now created this legacy, at least for ourselves. And we don't want it to end in all these bad ways that bands tend to end. Or that people just kind of peter out and get less interesting." Call it, in one reviewer's words, a "cry of continued relevance." It is R.E.M. 's reawakening. "Our goal has always been to write one of those great classic records that no one can deny is one of the great records of all time," Stipe said. "I don't know that'll ever happen, but ..."
"You think you've done it this time?" Mason asked. "No. But I think we made a damn good record!" Some of the photographs shown on-air in the Sunday Morning segment were from the book "R.E.M. : HELLO," published by Chronicle Books. The book contains six years of behind-the-scenes photography of R.E.M., along with handwritten captions from the band and an introduction written by Michael Stipe. The Seattle-based photographer David Belisle has worked with R.E.M., the Yeah Yeah Yeahs, Mudhoney, the Tiny Vipers and others. 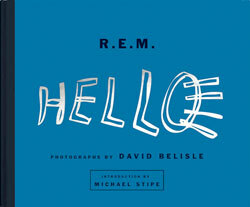 "R.E.M: Hello" will be available for purchase June 1, 2008.